The opening day of the trial was cut short after just a few minutes because of a national lawyers’ strike. CAPTAIN FRANCESCO SCHETTINO, dubbed Italy’s “most hated man” by tabloids over the spectacular crash of his cruise ship in 2012 with the loss of 32 lives, went on trial today charged with manslaughter. The 52-year-old, also dubbed “Captain Coward” over accusations that he abandoned ship while terrified passengers were still trapped on board, looked tense as he arrived for the start of the trial in Grosseto. It is being held in a theatre in the city, the closest to the site of the wreck of the Costa Concordia on the island of Giglio, due to the large numbers of survivors from the tragedy expected to attend. Schettino, wearing sunglasses and a blue jacket, came in through the press entrance by mistake and was immediately mobbed by dozens of reporters, fending them off and asking to be let through. 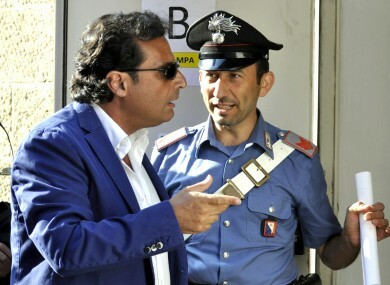 Schettino, who is not being detained during the trial, has asked for television cameras not to be allowed in. “Otherwise it would be a film,” he said in an interview with Italian daily Il Messaggero. There has been media havoc since the tragedy… This is not some village festival, this is a trial. There are people who died and a man who will try to explain. “I really think the truth will out,” he said. The hearing was cut short after just a few minutes because of a national lawyers’ strike and the trial was adjourned to a hearing on 17 July. With his slicked-back hair and macho swagger, Schettino has been portrayed as a villain who was showing off in front of a female guest by performing a risky “salute” manoeuvre which ended in tragedy. “Madonna, what have I done?” he was heard gasping on audio recordings from the bridge just after the crash. But his defence team has said that while he made mistakes he should not be the sole defendant, and the ship’s owner Costa Crociere, Europe’s top cruise operator, should share at least some of the blame. Lawyers for some survivors say he is a scapegoat. Locals in Grosseto also showed sympathy for Schettino. “We cannot just crucify Schettino,” said 28-year-old Maria at a bar in the city centre. The prosecution and defence have called hundreds of witnesses for the trial, although a judge will have to rule on the exact number during future hearings. There are also 250 parties that have asked to be plaintiffs, including the island of Giglio itself. The trial has been long awaited by the families of the victims and survivors who have complained about the long delays in Italy’s justice system, where criminal trials can last for months or even years. Schettino has been charged with manslaughter, causing environmental damage and abandoning ship and faces up to 20 years in jail. The Costa Concordia crashed into a group of rocks off Giglio on the night of January 13, 2012, with 4,229 people from 70 countries on board. The ship veered sharply and keeled over near the shore, sparking a panicky and delayed evacuation hampered by the failure of some lifeboats to deploy. Hundreds of people who had been sitting down to dinner were forced to jump into the sea to escape, many of them still wearing their formal evening wear. Survivors described scenes “like the Titanic”. Among those who died were an Italian honeymooner who could not swim, a Frenchman who gave his wife his life jacket before they leapt into the sea and a Hungarian musician who went back to his cabin to get his violin. Four other crew members and a Costa manager have entered plea bargains with brief prison sentences, which will be heard at a separate hearing on July 20. “This shows there were other responsibilities,” Schettino’s lawyer, Domenico Pepe, told reporters. Costa earlier admitted limited responsibility as Schettino’s employer and was ordered to pay €1 million in a controversial ruling that has excluded it from criminal proceedings. A vast salvage operation is under way to refloat the 290-metre (951-foot) vessel, which is not expected to be completed until later this year or in 2014. Email “"Most hated man in Italy" goes on trial over Costa Concordia sinking”. Feedback on “"Most hated man in Italy" goes on trial over Costa Concordia sinking”.